small towns and quaint villages are really what make us 'the heart of it all!' Wouldn't you agree? If you live in a small Ohio town, you get it. There's just no place like small town Ohio, they're downright delightful!". Throughout the year, the Village of Mantua is home to many special events, including the Mantua Potato Festival, the Portage County Soap Box Derby qualifier, Art on the Hill and Wine Tasting Too! (AOTH), a summertime Farmer's Market hosted by local faith-based ministry, an Annual Autumn 'Arts And Ales' Artisan Activity, 'Quilts In The Village' show, plus much, much more!... If you or your organization have interest in holding a special event in Mantua, please download and complete the Village of Mantua Special Events Request Form. The Tree City USA program has been greening up municipalities across America since 1976. A nationwide movement providing framework necessary to manage and expand public trees care, now for more than 20 years, Mantua has joined 3,400 + communities, who have made the commitment becoming a Tree City USA, achieving its status by meeting four core standards of sound urban forestry management: maintaining a tree board/department, having a community tree ordinance, spending at least $2 per capita on urban forestry, and celebrating Arbor Day. The following has been extracted, adapted, & updated, from the Village of Mantua Comprehensive Plan, 2008. The Village of Mantua has parks, hiking/biking trails, nature preserves, the Upper Cuyahoga State Scenic River, and numerous lakes and green spaces that make it an ideal place for outdoor recreation. There are also baseball fields and basketball courts for organized team sports. In 1998, President Clinton named the Cuyahoga River one of fourteen American Heritage Rivers. From Geauga County, through Mantua Village and south to State Route 14 in Streetsboro, the Cuyahoga River enjoys state-designated Scenic River status, a distinction celebrating its 50th anniversary golden jubilee!... Numerous acres of preserved open space and recreational park lands surround the banks of the Upper Cuyahoga State Scenic River. Marsh Wetlands State Nature Preserve and the Charles Tummonds State Nature Preserve, both along the Upper Cuyahoga State Scenic River, and in the Mantua Village area, are held by the Ohio Department of Natural Resources (ODNR) Division of Natural Areas and Preserves. Marsh Wetlands is west of Peck Road and south of the Headwaters Hike & Bike Trail. Tummonds State Nature Preserve is located south and west of Mantua Village, but is part of a continuous protected area along the Upper Cuyahoga State Scenic River, that begins in Mantua Village. According to ODNR, Marsh Wetlands is 153 acres of "excellent habitat For waterfowl as well as numerous other wetland species of both plants and animals." It was dedicated in 1990 and is classified as an Emergent Marsh 1. It is a part of the 'Mantua Swamp' region, enjoying more than 40 years of distinction, designated as a National Natural Landmark (NNL) in 1976 by the U.S. Department of the Interior, National Parks Service (NPS). It is the only such recognized site in Portage County, among 20+ in Ohio, joining some 520 celebrated NNL phenomena across America! Buchert Memorial Park occupies 12.7 acres of land along the banks of the Upper Cuyahoga State Scenic River on the south side of High Street and 6 additional acres on the north side of High Street. It is the location of the famous Mantua Potato Festival, hosted each September, now held for some 45 years, celebrating the heritage of a major agricultural crop grown in the area. Delicious food made from potatoes, such as candy, doughnuts, pierogies, pancakes, bread, cookies, French fries, potato chips and baked potatoes are highlighted during the festival. Fun-filled activities are offered during the weekend of the celebration. Other activities are held at the Buchert Memorial Park, such as the Portage Park District & its Foundation annual summer Adventure Race, now a distinctive second Saturday of July early morning lead-in to the Portage County award-winning inaugural 'best arts & culture' recipient AOTH event  a major fund raising event hosted by the Downtown Mantua Revitalization Corporation (DMRC). Post-event river racers, runners, and riders join shoppers, as they all can select from a wide array of locally produced artisan wares & wines, Mantua-area grown produce, plus community crafts. The Soap Box Derby is held in early summer with contestants racing down High Street past Buchert Memorial Park! A 'Dog Park' is also now under consideration. Mantua Village is in the process of upgrading & rededicating the Buchert Memorial Park Trail. The trail is located along the edge of the Upper Cuyahoga State Scenic River, allowing easy access to the adjacent Buckeye Trail and Headwaters Hike & Bike Trail. Mantua Village. with assistance from DMRC, has applied for, & received grant assistance from, ODNR program initiatives, and funding assistance, previously, from the Portage County Board of Commissioners, to construct the Buchert Memorial Park Trail as well as a 16 ton, 90-foot long pedestrian/bicyclist bridge, designed by CT Consultants, over the Upper Cuyahoga State Scenic River  serving as a Trailhead node for nearby Downtown Mantua. The Glacial Esker Trail (GET) is located behind the Mantua Village Water Treatment Plant, near the Upper Cuyahoga State Scenic River, in the southwest portion of Mantua Village. It is an unimproved 8-foot wide trail on the top of a ridge resulting from the last glacial retreat. The Trail runs between a small lake and the Upper Cuyahoga State Scenic River. It is intended to be a 'loop trail' at some point in the future. The Mantua Village Water Treatment Plant wellheads are adjacent to the Trail. The Mantua Rotary Club has provided trail signage and a resting facility  'Rotary Grove' -- with benches and picnic tables near the GET trailhead. 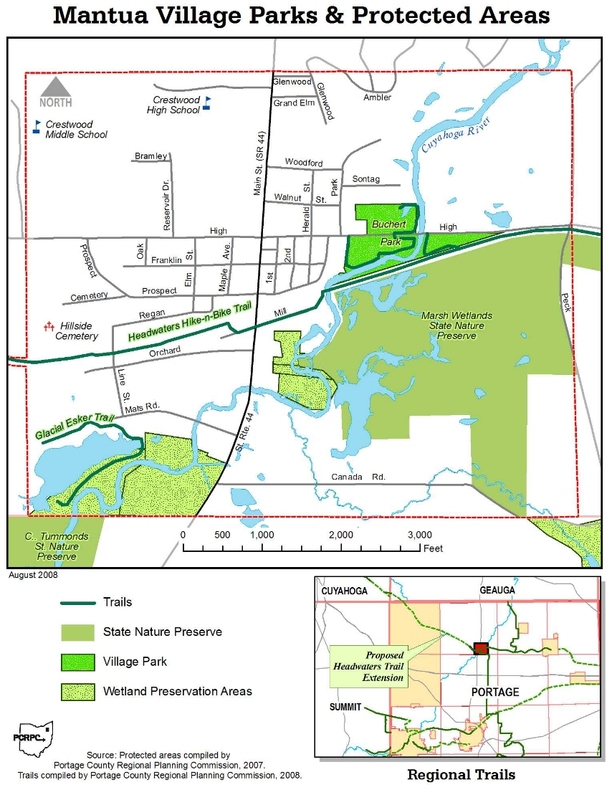 The crushed limestone Headwaters Hike & Bike Trail, designed for hiking, biking and horseback riding, is now designated to be fully owned and maintained by the Portage Park District (PPD). It crosses Mantua Village along the abandoned rail bed of the Erie-Lackawanna Railroad, though a portion in the center of Mantua Village, runs slightly south of the original railroad, near the quaint, historic Downtown Mantua commercial district. Approximately two miles of the eight and one-half miles of completed Trail pass through Mantua Village. The bridge installed in 2003 allows Trail users to cross the Upper Cuyahoga State Scenic River, then immediately heading west to cross State Route 44, via an ODNR-funded 'hike & bike' "Connector" lane. The Headwaters Trail begins in Garrettsville Village and has been completed to Mennonite Road, west of Mantua Village. The section to Mennonite Road was constructed with funds obtained through an ODNR Recreational Trails Fund (RTF) grant and the Portage County Commissioners. Plans call for an extension of the trail to the northwest, along the abandoned railroad bed into the City of Aurora, through Geauga County, and into Cuyahoga County. The Headwaters Trail may also be extended east from Garrettsville into Trumbull County. These discussions are assisted between & among the neighboring communities with which Mantua Village partners, its local service club organizations, Buckeye Trail Association (BTA) representatives, the Portage County Regional Planning Commission (PCRPC), PPD, ODNR, DMRC, and at regional meetings regularly coordinated by the Headwaters Trail 'Connecting Communities' Collaborative Consortium ("HT4Cs").